Nissan the polar bear has arrived in Yorkshire sent from Russia with love. The 22-month-old is settling in well at his new home after an epic journey from Moscow to be part of the award-winning Yorkshire Wildlife Park’s Project Polar. 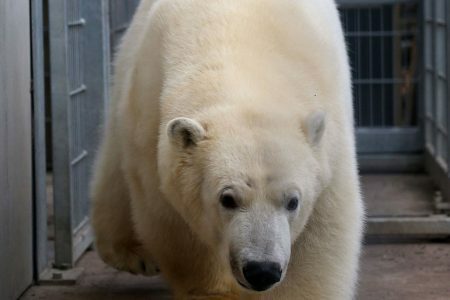 He joins favourites Victor, 16, and two-year-old Pixel at the 10 acre Project Polar reserve at the innovative park, near Doncaster. Nissan was transported in climate controlled conditions during his journey by air, road and sea that took him from his former home in the Russian capital via Frankfurt on a plane trip before continuing the 1,000 mile journey by road and ferry. His transfer was almost a year in planning with strict welfare regulations in force throughout the trip although no-one could have planned for the moment his truck was briefly entered by a group of migrants at Calais before the Gendarmes restored order. Nissan, who was born at Izevesk Zoo, in Russia, on December 12, 2013, becomes the third polar bear at Yorkshire Wildlife Park’s Project Polar, one of the world’s largest polar bear reserves. The purpose-built ten acre site, which is divided into four sections, featuring landscaped hills, valleys and lakes with water up to 8 metres deep. It is a centre for polar bear conservation, welfare and research The Project Polar Appeal is raising funds to help polar bears and YWP is working with Polar Bears International. Nissan is part of the European breeding programme (EEP) and YWP plays a critical role in this by holding retired males like Victor or young males like Pixel and now Nissan who are not currently needed in the breeding programme..
Simon explained ‘ Young males in the wild would naturally leave their mothers at around 2 years old and then would spend the next couple of years growing and building up their strength to be able to compete for breeding rights over the females. YWP has built one of the largest polar bears reserves in the world to be able to manage the older, retired males and also the young males before they are old enough to start a family of their own if they are needed elsewhere in the breeding programme.. Project Polar has been designed to replicate their Arctic tundra habitat and at 10 acres gives them the space to behave naturally. Males enjoy each other’s company and will spend time together in the wild so it is very natural to keep males together in captivity. YWP, which puts conservation at the heart of all its activities, brings visitors almost face to face with some of the world’s most rare and beautiful animals, including Amur Leopards and Tigers, Lions, Meerkats, Giraffes and many more.